HUNTINGTON – It wasn’t the way she may have drawn it up, but Wawasee’s Reagan Atwood will take it. 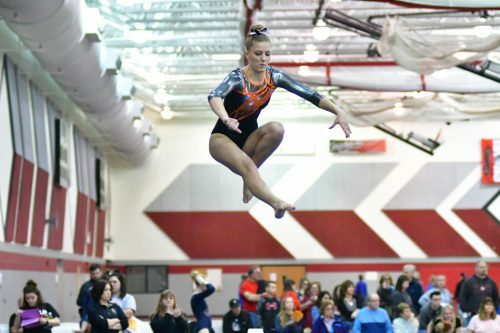 The senior will return to the IHSAA Gymnastics State Finals on floor and also get an entry on beam after her performances Saturday at the Huntington North Gymnastics Regional. 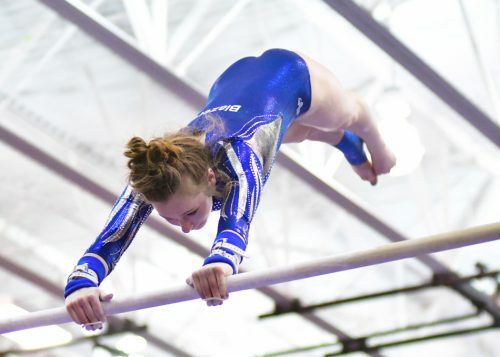 Atwood made her return on floor after placing in a tie for sixth with Elkhart Central’s Skiler Reveal with matching 9.175 scores, a big redemption statement for Atwood after last weekend’s sectional. Her opening beam score of of 9.275 was good for fourth in the regional. Elkhart Central’s Analena VanderZwaag performs on the bars. After how the sectional ended, Wawasee head coach Nika Prather was thrilled with how Atwood, and her team overall, responded on the floor. Atwood was ninth on bars at 8.825 and landed 18th on vault at 8.85 to give her an all-around tally of 36.125, which was tied for ninth in the meet. Wawasee didn’t have any other members make it out of the regional. Jada Parzygnot was the closest to break through to the top six qualifying spots. Parzygnot finished in a three-way tie for ninth at 9.025 on floor and was in another three-way tie for 10th on bars at 8.8. Aundreya Wegener tied for 14th on beam at 8.8. Wawasee ended up sixth on the team depth chart at 104.325 in the six-team field, .375 behind DeKalb’s 104.7. Elkhart Central missed the team advance for state at 108.075, falling short of third-place Fort Wayne Dwenger’s 108.825. Homestead was second with a 109.575 and Fort Wayne Carroll was sensational with it’s championship score of 111.075. Warsaw’s Remi Beckham performs on the beam. Elkhart Central will have two gymnasts working on their state chops in the Industrial Park for another week. Reveal earned her ticket on floor with Atwood, as did teammate Analena VanderZwaag, who had a fantastic meet. The Flying Dutchman was second overall on floor at 9.325 to headline her day, which boosted her all-around score to 37.150 to land in second overall, just behind Carroll’s McKinley Carroll at 37.175. VanderZwaag was sixth on vault at 9.425, sixth on bars at 9.25 and tied for sixth on beam at 9.15. 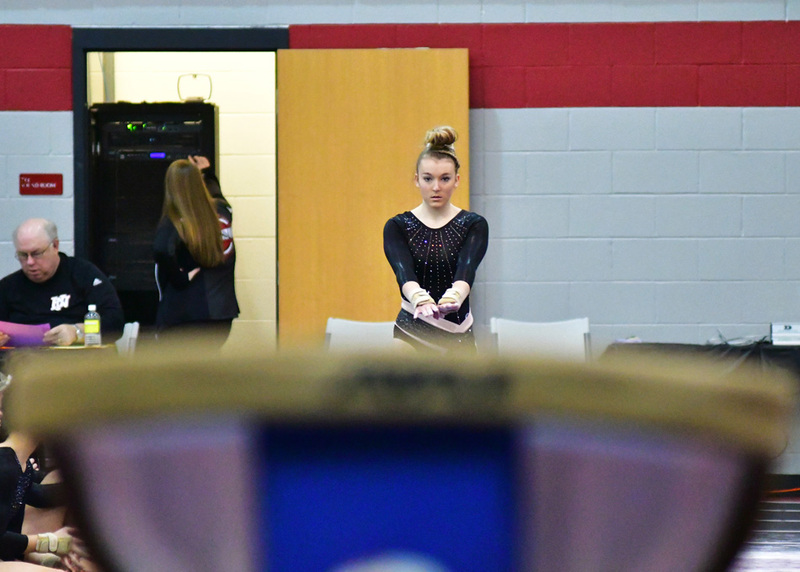 The lone Warsaw representation at the regional was junior Remi Beckham, who had to wait until the very last competitor of the day on the beam. Beckham was shaky to start, and a fall on her final skill which would build to her dismount left Beckham in 26th place at 7.25. 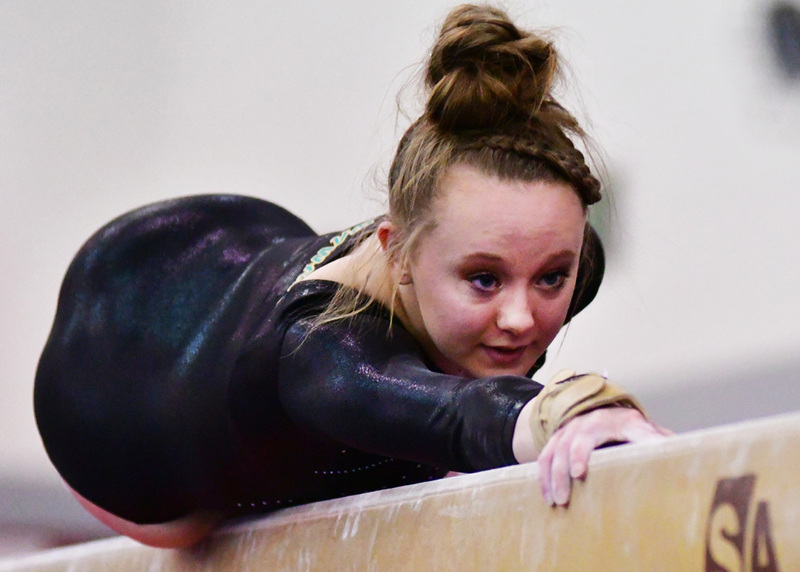 Meet winners at Huntington North included Shiloh Miller of DeKalb on vault at 9.7, Ashelynn Steinke of Carroll on bars at 9.6, Yana Weir of Homestead on beam at 9.475 and Danielle Korporal of Huntington North on floor at 9.35. The IHSAA State Finals will take place next Saturday at Worthen Arena on the campus of Ball State University. Wawasee’s Aundreya Wegener performs on the beam.